Valve replacement surgery has a long, important, and inspiring history. ,,,, The attempts to surgically correct valvular heart disease through valvuloplasty started in the 1920s, but the results had been discouraging. C. Walton Lillehei, Henry Bahnson, and many other surgeons tried to attach individual polymer leaflets, but the results were poor because of the subsequent rupture. The development of prosthetic heart valves involved a search for biologically compatible materials and hemodynamically tolerant designs. Several demonstrations and analysis were carried out by trial and error methods, but no satisfactory mechanism was found to achieve a hemodynamically stable, implantable, and durable heart valve. This review is an effort to discuss the innovations and designing efforts involved in the development of mechanical prosthetic heart valves. The search of avoiding thromboembolic complications of mechanical prosthetic valves and lifelong anticoagulation and associated side effects lead to bioprosthetic tissue valves which were developed later in the history but are not included in the present discussion. The need of prosthetic heart valves was recognized long ago but seemed like an impossible vision until 1952. Dr. Charles Hufnagel implanted an acrylic ball valve prosthesis into the descending aorta of a 30-year-old woman to correct aortic valve insufficiency in 1952 at Georgetown Medical Center in Washington, DC, who could lead a normal life after the surgery [Figure 1]. , Hufnagel's invention was a methylcrylate chamber containing the methylcrylaye ball in the middle, which was "implanted quickly into the descending aorta using a nonsuture technique." More than 200 implanted Hufnagel valves functioned for as long as 30 years with no significant wear. No anticoagulation was used. The drawback to this model, besides the mortality and cumbersome insertion during the brief cross-clamp period, was that patients could hear the plastic ball bouncing around inside them. At a later stage, a hollow nylon ball coated with silicone rubber was used for designing the valve instead of the methacrylate ball which eventually reduced the valve noise. Hufnagel valves and his experiments on biocompatible materials successfully proved that synthetic materials could be used to create heart valves. The major hitch of Hufnagel valves was that it could only be positioned in descending aorta and not inside the heart and, therefore, had poor hemodynamics. Because of these reasons, it failed to resolve the diseased valve, instead it alleviated the symptoms. Figure 1: The beginnings of the Prosthetic valve. In the mid-1960s, another successful valve was introduced, called as Starr-Edwards Ball Valve ,,] - which was actually an improved version of Hufnagel's ball-valve which could be implanted in the heart after excision of the diseased valve. A silastic ball with circular sewing wing was used in designing of the valve was slightly smaller in size and was caged from both the sides [Figure 1]. 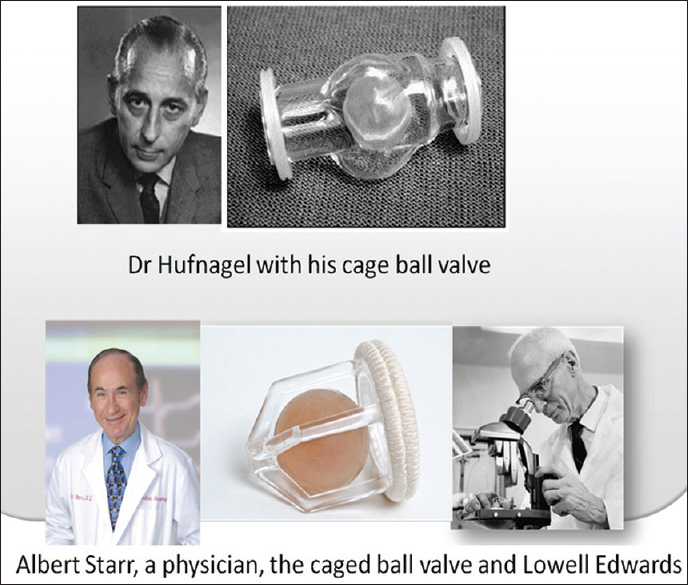 Albert Starr, a physician, and Lowell Edwards, an electrical engineer, simplified the caged-ball valve using a single titanium cage, a silastic ball, and a sewing ring covered with Teflon. The Starr-Edwards valve was first implanted in the mitral position in 1960, and later in the aortic position. The valve became commercially available in 1965. In comparison to Hufnagel's valve, with the caged-ball valve, the ease of implantability was more. It had a sewing ring which made the process of suturing of valve easy for surgeons. The silastic ball of the valve had a tendency to absorb liquid which malformed it or at times resulted in jamming. Moreover, the obstacle to the laminar blood flow used to cause high pressure gradients, which was observed more in patients with a small aortic root. In the early 1960s, many of the surgeons recognized the obstacles faced during implant, especially in the placement of prosthetic valves in the heart. Dr. Magovern Senior Chief of Cardiothoracic Surgery and Mr. Harry Cromie [Figure 2], an engineer worked together at the University of Pittsburgh Medical Center and developed a ball valve. He was concerned more about the time taken to suture or fix the valve into the heart and this outlook made him approach the development of prosthetic valve in a different way. He designed the valve in a manner that it eradicated the requirement of suturing for fixation of prosthetic valve. The procedure was based on mechanical fixation which requires only a few minutes. The essential feature of this fixation was the use of multiple curved pins to hold the valve in the aortic annulus. The valve was for the 1 st time implanted in 1962 and was used for many years in both mitral as well as aortic positions. The production of the valve was stopped in 1980 due to various reasons, although Magovern continued to implant the valve for the next couple of years. A study by Dr. Magovern, collected the data of 25 years, which showed that the valve was used in approximately 4,798 cases. 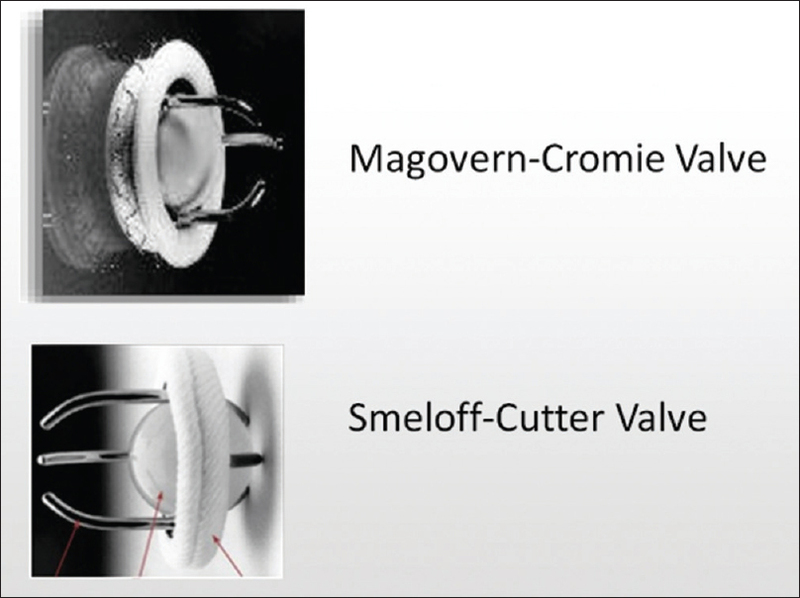 The data analyzed by them showed that the Magovern-Cromie valve was safe, durable, and efficient. The valve-related morbidity observed was in the lower expected ranges for prosthetic aortic valves: Ball variance, 0.3%/patient-year; paraprosthetic leak, 0.41%/patient-year; valve endocarditis, 0.43%/patient-year; valve thrombosis, 0.04%/patient-year; and embolic events, 3.95%/patient-year. The incidence of aortic valve reoperation was 0.76%/patient-year. The 5-year, 10-year, and 20-year probability of survival corrected for normal mortality was 77%, 64%, and 52% for all discharged patients. Figure 2: Some of the early valves. In 2008, the longest functioning Magovern-Cromie Sutureless prosthetic aortic valve was reported. The valve was explanted 42 years after implant. In 1963, Smeloff along with a mechanical engineer at California State University,  Sacramento designed a valve to employ a "FULL-FLOW" orifice concept. The valve design comprised a double set of cages permitting the silicone elastomer ball to rest on the smaller inflow cage during valve closure. As the valve was one of its kind, therefore commercial manufacturing of it was then transferred to Cutter Laboratories, Berkley California in 1966. In 1989 at the World Congress on Valve replacement, San Diego, Dr. Smeloff reported that 50,000 Smeloff valves had been implanted worldwide, with no structural failure for 22 years of use. Braunwald  developed a flexible polyurethane-dacron fabric mitral valve prosthesis with attached Teflon-tape chordae tendoneae. The valve was implanted in March, 1960. Dr. Braunwald observed that the fabric was infiltrated by fibrous connective tissue and she speculated that applying fabric to the metal cage of a ball valve might reduce thrombus formation. Thereafter, she started working with cutter laboratories to develop a cloth covered caged ball valve. They covered the struts with a knit dacron tubing and the inflow ring with an ultrathin polypropylene mesh fabric. The valve was used clinically from 1968 onwards. Results obtained were good and low incidence for valve-related complications were observed. Approximately 475 valves were implanted. However, after several years of clinical use cases were reported of fabric wear and silicone poppet abrasion in aortic valves leading to poppet escape. Thus, production of the Braunwald-Cutter valve ceased in 1979. Dr Michael DeBakey and Harry Cromie of Surgitool introduced a ball valve in 1967. In 1969, Dr. Jack Bokros at the General Atomic Company, LaJolla, California introduced a new carbon material pyrolytic carbon poppet which replaced the polyethylene poppet. The pyrolyte ball was intended to limit ball variance; unfortunately, the relatively hard ball and soft titanium cage led to strut wear and some instances of strut fracture. The fabrication of a hollow ball of pyrolytic carbon (pyrolyte) was a landmark research in mechanical valve development. It was originally developed for the encapsulation of nuclear fuel rods, and became over the next decade, the principal biomaterial for virtually all new mechanical valves. Dr Bokros'  found that highly polished pyrolytic carbon will not bond with heparin and in canine in vivo screening tests, the Bokros material proved to be the most thrombo resistant, nonheparinized material that they had evaluated. Encouraged by their findings, Bokros subsequently developed the ball poppet for the DeBakey-Surgitool valve and the discs and leaflets for virtually all mechanical valves developed over the next 30 years. Dr Jerome Kay, Professor of Cardiac Surgery at the University of Southern California Medical Center, and a valve engineer, Mr Donald Shiley collaborated together and introduced the Kay-Shiley disc valve. It was the first disc valve that achieved worldwide use beginning in 1965. It was designed with a low profile. It was a reliable mitral prosthesis that utilized a stellite housing and a flat silicone elastomer disc. Unfortunately, there were problems with wear of the silicone elastomer disc and hence was replaced with a Delrin polymer disc in 1975. Valve durability was markedly improved with the Derlin disc. Approximately, 12,000 of these Kay-Shiley valves were implanted worldwide at mitral and tricuspid positions. To prevent the disc impingement by the left ventricular wall, Dr. Kay modified the standard Kay-Shiley valve and added a muscle-guard onto it. It was used by Dr. Kay primarily, but was not used worldwide by other surgeons. Following the trend, Dr. Arthur Beall, Baylor college of Medicine in Houston in collaboration with Mr. Howard Cromie, Surgitool developed a Teflon disc valve in the mid 1960s. Over a period of 10 years of clinical existence, the valve was redesigned 5-time. Post this changes in design of the valve, almost 5,000 valves were implanted at the mitral position. In 1985, the production was discontinued due to the fabric wear on the annular opening. In the mid-1970s the tilting disc valve were introduced. These included the Bjork-Shiley convexo-concave (BSCC) tilting disc valve, Lillehei-Kaster tilting disc valve, Omniscience tilting disc valve, Omnicarbon tilting disc valve and Hall-Kaster and Medtronic-Hall tilting disc valves [Figure 2]. The very first tilting disc model, i.e., BSCC tilting disc was implanted in 1975. ,,, The valve was designed in a manner so that a large flow through the orifice on the backside of the open disc could be obtained. Both the stellite housing and concave pyrolyte disc were used. The inlet and outlet struts were modified such the disc could make a slide forward and down movement of about 2 mm, thereby achieving the desired enlargement of the valve orifice. However in a few years of its use, cases were reported of an inordinate number of fractures at the weld site of the small c-shaped outflow strut. Bjork reported the hazard function and mechanical failure among the series of BSCC heart valves. The trend was observed for almost 7-year follow-up period. The 7-year actuarial incidence of mechanical failure among these valves was found to be 12.5% and many of the patients with these valves was considered for prophylactic replacement. The bileaflet model had advantages over earlier models. The design of the valve was such that it resulted in a greater effective orifice area (2.4-3.2 cm 2 ). They were the least thrombogenic valves in comparison to other prosthetic valves. 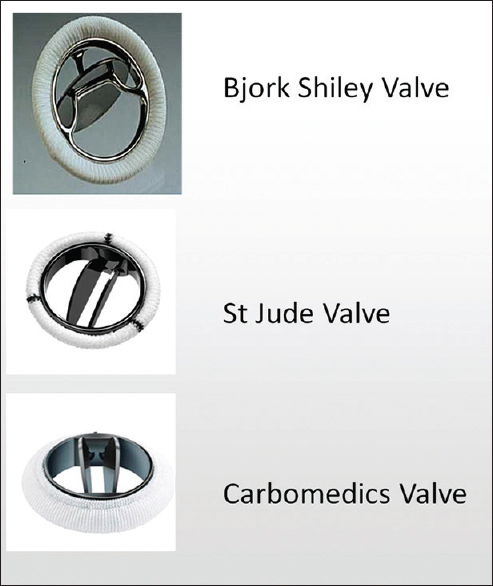 The types of bileaflet valves developed were Gott-Dagette bileaflet valve, Kalke-Lillehei bileaflet valve, St. Jude Medical bileaflet valve and Carbomedics bileaflet valve [Figure 3]. Figure 3: The tilting disc valves. The Gott-Daggett bileaflet valve was the very first model of bileaflet design and was introduced in the late 1960s. It was implanted in approximately 500 patients at both mitral and aortic positions. The clinical outcome was relatively good. Despite of bileaflet design, the valve had one disadvantage. A relatively stagnant blood flow in the area of the superstrut used to capture the flexible leaflets, was observed. This area was occasionally the site of thrombus; however, no clinical episodes of thromboembolism were reported. For this reason, the valve was withdrawn from the market in 1966; the patients who were implanted with this valve were followed for more than 25 years. No deterioration of the flexible silicone-coated Teflon leaflets were reported during this period or even later on. The St. Jude Medical bileaflet valve was implanted in 1977 for the 1 st time. Mr. Manny Villafana, founder of Cardiac Pacemaker St. Jude Medical was the implementer for the development of St. Jude Medical bilefalet valve. The valve was primarily designed by an individual engineer Xinon (Chris) Posis, and he took suggestions from the cardiovascular surgeon Dr. Demetre Nicoloff, University of Minnesota. Furthermore, both of them worked together and took suggestions from other surgeons and fellow engineers. Working with Jack Bokros, the engineers Posis and Hanson modified the initial pivot mechanism and came up with the concept of a leaflet-tab rotating in a "butterfly recess" in the inner wall of the housing. Doctor Nicoloff implanted the first St. Jude valve on October 3, 1977. The design of the valve remained unchanged for over a period of 26 years. Following this, St. Jude Medical introduced their Regent Valve in 1999 which incorporated a housing design that significantly improved the orifice size of smaller aortic prostheses. With more than 1.3 million St. Jude valves implanted, it is the most widely used prosthetic valve in the world. The TTK Chitra valve was developed in Sri Chitra Institute [Figure 4] in Trivandrum and first implanted in December 1990. 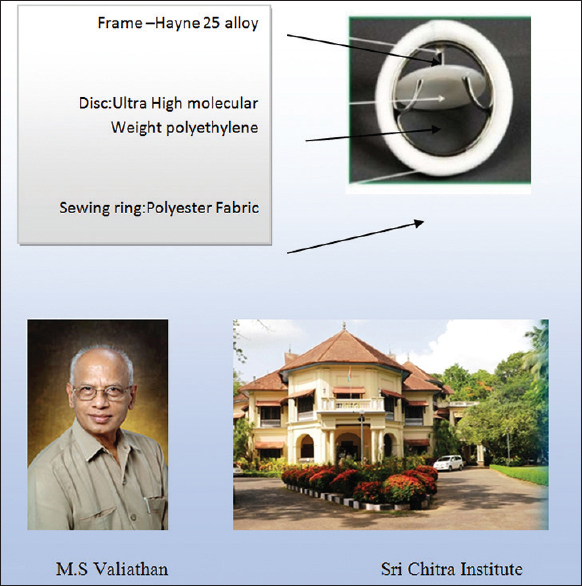 M. S Valiathan was the surgeon who was the main force behind the development of the Chitra valve and the current valve is the 4 th generation valve. More than 75000 have been implanted. It is a tilting disc valve. The Chitra tilting disc valve has an integrally machined cobalt-based alloy cage, an ultra-high molecular-weight polyethylene disc, and a polyester suture ring. Figure 4: Indian prosthetic valve TTK Chitra valve. Between December 1990 and January 1995, 306 patients underwent isolated aortic valve replacement ([AVR], n = 101) or mitral valve replacement ([MVR], n = 205) at six institutions in India. The early mortality rate was 6.9% (seven after AVR; 14 after MVR). A total of 285 survivors was followed up until September 1998; total follow-up was 1212 patient-years (pt-yr) (AVR, 445 pt-yr; MVR, 767 pt-yr). Over the last 60 years, a remarkable progress has been achieved in mechanical valves. There are a number of valve substitutes available in the market, but none of them are completely achieving the standards laid by Harken for an ideal valvular substitute. Two of the six mechanical heart valves currently available for implantation (the Starr-Edwards ball valve and the St. Jude Medical bileaflet valve) are virtually unchanged from the original models implanted. Four other mechanical valves approved for implantation (Omniscience, Omnicarbon, Medtronic-Hall, and Carbomedics valves) have been in use for more than a decade with essentially no mechanical failure. Pyrolytic carbon, a compatible and virtually indestructible biomaterial adapted from the nuclear fuel industry, has enabled a lot of progress. There will always be room for improvement in mechanical valves. Eventually, with the right valve design and the right valve material, it is conceivable that we may someday have a mechanical valve that does not require lifelong anticoagulation therapy. Ms Neha Sharma, Clinical Research Associate for collecting historical material related to the article. Hufnagel CA, Harvey WP, Rabil PJ, McDermott TF. Surgical correction of aortic insufficiency. Surgery 1954;35:673-83. Hufnagel CA. Aortic plastic valvular prosthesis. Bull Georgetown Univ Med Cent 1951;4:128-30. Harken DE, Taylor WJ, Lefemine AA, Lunzer S, Low HB, Cohen ML, et al. Aortic valve replacement with a caged ball valve. Am J Cardiol 1962;9:292-9. Harken DE. The emergence of cardiac surgery. I. Personal recollections of the 1940s and 1950s. J Thorac Cardiovasc Surg 1989;98(5 Pt 2):805-13. Starr A, Edwards ML. Mitral replacement: Clinical experience with a ball-valve prosthesis. Ann Surg 1961;154:726-40. Starr A, Herr R, Wood JA. Accumulated experience with the Starr-Edwards prosthesis 1960-1968. In: Brewer LA 3 rd , editor. Prosthetic Heart Valves. Springfield, IL: Charles C. Thomas; 1969. p. 148-63. Swanson JS, Starr A. The ball valve experience over three decades. Ann Thorac Surg 1989;48 3 Suppl:S51-2. Magovern GJ, Liebler GA, Park SB, Burkholder JA, Sakert T, Simpson KA. Twenty-five-year review of the Magovern-Cromie sutureless aortic valve. Ann Thorac Surg 1989;48 3 Suppl:S33-4. Smeloff EA. Comparative study of heart valve design in the 1960s. Ann Thorac Surg 1989;48 3 Suppl:S31-2. Braunwald NS. It will work: The first successful mitral valve replacement. Ann Thorac Surg 1989;48 3 Suppl:S1-3. Bokros JC. Carbon in prosthetic heart valves. Ann Thorac Surg 1989;48 3 Suppl:S49-50. Kay JH, Tsuji HK, Redington JV. Experiences with the Kay-Shiley disc valve. In: Brewer LA 3 rd , editor. Prosthetic Heart Valves. Springfield, IL: Charles C. Thomas; 1969. p. 609-20. Beall AC Jr., Morris GC Jr., Howell JF Jr., Guinn GA, Noon GP, Reul GJ Jr., et al. Clinical experience with an improved mitral valve prosthesis. Ann Thorac Surg 1973;15:601-6. Wukasch DC, Unger F, Reul GJ, et al. Long-term results in cardiac valve replacement. Comparison of 6335 various type prostheses. In: Davila JC, ed. Second Henry Ford Hospital international symposium on cardiac surgery. New York: Appleton-Century-Crofts:1977:510-9. Bjork VO. Advantages and long-term results of the Bjork-Shiley valve. In: Vogel JH, editor. Cardiovascular Medicine. New York: Raven Press; 1982. p. 93-4. Lindblom D, Rodriguez L, Björk VO. Mechanical failure of the Björk-Shiley valve. Updated follow-up and considerations on prophylactic rereplacement. J Thorac Cardiovasc Surg 1989;97:95-7. Aris A, Igual A, Padró JM, Burgos R, Vallejo JL, Rabasa JM, et al. The Spanish Monostrut Study Group: A ten-year experience with 8,599 implants. Ann Thorac Surg 1996;62:40-7. Stewart S, Cianciotta D, Hicks GL, DeWeese JA. The Lillehei-Kaster aortic valve prosthesis. Long-term results in 273 patients with 1253 patient-years of follow-up. J Thorac Cardiovasc Surg 1988;95:1023-30. Mikhail AA, Ellis R, Johnson S. Eighteen-year evolution from the Lillehei-Kaster valve to the omni design. Ann Thorac Surg 1989;48 3 Suppl:S61-4. di Summa M, Poletti G, Brero L, Centofanti P, La Torre M, Patanè F, et al. Long-term outcome after valve replacement with the omnicarbon prosthesis. J Heart Valve Dis 2002;11:517-23. Butchart EG, Li HH, Payne N, Buchan K, Grunkemeier GL. Twenty years′ experience with the Medtronic Hall valve. J Thorac Cardiovasc Surg 2001;121:1090-100. Gott VL, Daggett RL, Young WP. Development of a carbon-coated, central-hinging, bileaflet valve. Ann Thorac Surg 1989;48 3 Suppl:S28-30. Lillehei CW, Nakib A, Kaster RL, Kalke BR, Rees JR. The origin and development of three new mechanical valve designs: Toroidal disc, pivoting disc, and rigid bileaflet cardiac prostheses. Ann Thorac Surg 1989;48 3 Suppl:S35-7. Emery RW, Arom KV, Kshettry VR, Kroshus TJ, Von R, Kersten TE, et al. Decision-making in the choice of heart valve for replacement in patients aged 60-70 years: Twenty-year follow up of the St. Jude Medical aortic valve prosthesis. J Heart Valve Dis 2002;11 Suppl 1:S37-44. Gillinov AM, Blackstone EH, Alster JM, Craver JM, Baumgartner WA, Brewster SA, et al. The carbomedics top hat supraannular aortic valve: A multicenter study. Ann Thorac Surg 2003;75:1175-80. Kumar P, Dalvi B, Chikkatur R, Kandhachar P, Parida R, Ahuja V, et al. TTK Chitra tilting disc valve: Hemodynamic evaluation. Indian J Thorac Cardiovasc Surg 2004;20:117-21. Sankarkumar R, Bhuvaneshwar GS, Magotra R, Muralidharan S, Rajan RS, Saha D, et al. Chitra heart valve: Results of a multicenter clinical study. J Heart Valve Dis 2001;10:619-27.